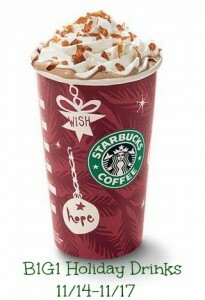 Mark you calendars because Starbucks is offering Buy One Get One FREE holiday drinks on 11/14-11/17 from 2-5pm! Choose from some of their most popular drink including the delicious Caramel Brulee latte, Gingerbread Latte or Peppermint Mocha. It’s always fun to have a Starbucks coffee date especially when a FREE drink is involved! Also, don’t forget that you can sign up for additional Holiday Offers from Starbucks when you text JOY to 207-57 . Last year they sent out B1G1 offers and FREE with purchase among other deal! Let me know what deals you receive!